For the lemon and herb crumb, heat the oil to 200°C in a pan. Fry the crumbs until golden and remove, drain and set aside on kitchen paper to remove excess oil. Once cooled, chop the parsley and add to the crumbs along with the lemon zest and sea salt. Set aside. To make the crab cakes, finely chop the parsley and and combine with the remaining ingredients (apart from the egg yolks and crumb). Divide the mixture into 6 equal portions and shape on a flat surface using a circle ring about 6.5cm in diameter. Compress the mixture in the ring and make an indentation/well. Place an egg yolk into each well. To cook the crab cakes, place on the oiled Flat Plate of either the Force or the Furnace BBQ, set low. Close the lid to raise the temperature. Every few minutes flick some water onto the plancha surface to create some steam and close the lid again, this will help cook the egg yolk. The total cooking time is around 8 minutes, leaving you with a golden brown crispy bottom and a warm, runny egg yolk. 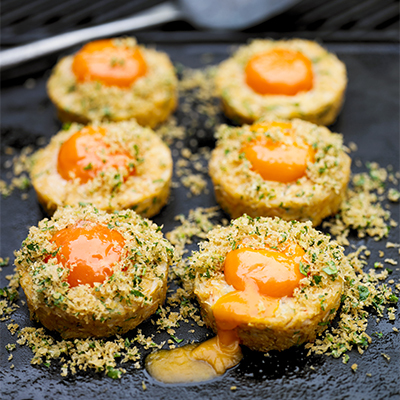 To finish, remove from the BBQ and sprinkle the lemon and herb crumb on top of each crab cake.